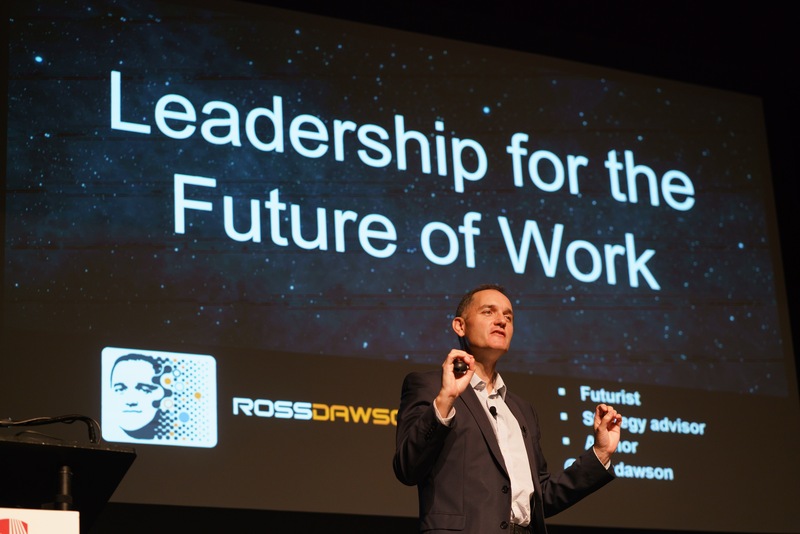 The future is unpredictable, but we know that it is going to change dramatically, futurist and keynote speaker Ross Dawson said during his “Leadership for the Future of Work” lecture at the Charles B. Wang Center on Monday, Oct. 23. Dawson, the author of multiple books about human networks including “Living Networks,” said the structures, disciplines, organizations and types of work will change greatly in the future. “Whatever we prepare ourselves for now, we have to be prepared for that to change again,” Dawson said. “So, adaptability needs to be something that we instill in our children, universities and educational institutions.” He said the fundamental differences between humans and machines are going to play an important role in redesigning future works, where humans’ unique capabilities play roles that are complementary to machines, and vice versa. Vice President for Communications and Marketing and Chief Communications Officer Nicholas Scibetta has worked with Dawson for many years. “Universities or higher education are really in this interesting time of how are we, as Ross said, how are we helping students to be prepared to go into a very complicated and fractured work environment,” he said. “I hope that humanity rises above its current level of discord and small-mindedness,” she said. In a Pew Research Center study, which Dawson cited during his lecture, experts were asked whether Al and robotics would create more jobs than it would destroy. Of those who participated, 52 percent envisioned a future where more jobs are created than lost, whereas 48 percent envisioned more jobs lost than created. Dawson said both of these possibilities are equally tangible, where the future of work may follow a negative trend or a positive one. But he remains hopeful.